The Ryobi RJ162VK is one of the more inexpensive corded reciprocating saws on the market today. With that said, it’s hard not to appreciate what you get for the money. While it’s not a particularly powerful model, the 6.5 amps seem to drive it hard enough to handle most light metal and easy demo work. For serious demolition, you’ll want something with an orbital function and a tad more horsepower—check out our heavy duty reciprocating saw shootout for the best full-power saws. Pick up the Ryobi RJ162VK recip saw, and you’ll start to imagine the possibilities this lightweight tool can afford you in your home improvement projects. Contrast this to the heavier and more unwieldy Dual Tools DualSaw RS1200 reciprocating saw. The handle on the Ryobi RJ162VK is angled back nicely, giving you plenty of leverage when guiding the blade downward, and the rubberized coating Ryobi puts on it means that the saw will never slip – even when your hands are sweaty (of course, around here we’re prone to wearing work gloves). The equally rubberized front boot has less texture, but still provides plenty of tactile grip for really controlling the cut. Where the saw comes up short – and is thus recommended for the weekend warrior/handyman and not the contractor – is its meager feature set. The RJ162 lacks an adjustable shoe to vary the cutting depth. Speed is varied via the use of a dial on the top of the handle – as opposed to a variable speed trigger – which is preferred by most reciprocating saw aficionados. There is no orbital cutting feature – so serious demo work will take longer and, as a result, cause more fatigue to the user. Surprisingly (at this price at least) the tool does have a metal gear housing which, in our book, significantly upped its value rating. We liked the fact that the saw came with a hard plastic storage case but found that the case proved to be almost more trouble then it was worth due to its poor extra blade storage and the fact that the cord has to be tucked in just-so before we could close the lid. We used the RJ162 for cutting away existing 2×4 material that was part of an older home during a renovation project. The reciprocating saw allowed us to sever dozens of 16d nails without so much as a hiccup. 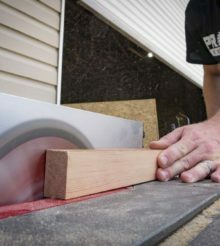 This seemed to be what the Ryobi was made for – consistent performance, provided you aren’t trying to slice through multiple layers of pressure-treated lumber. The real advantage to this tool is its weight. It’s easy to lift overhead and you won’t incur fatigue when using it in short bursts for home projects or the average handyman task. One problem we ran into over time was the tendency for the tool-less blade change system to stick. This meant that when it came time to flip the blade out for a different one, the release lever would lift (too easily) and the mechanism would fail to release the blade. Spraying some WD-40 into the mechanism got it back into working order quickly and we found that periodic WD-40 “maintenance” was key to preventing this from occurring again. Still, after some time it did occur again (we hadn’t lubed it up in a while) and we wonder if a design change isn’t in order. The Ryobi RJ162VK is a sensible 6.5 amp reciprocating saw that is perfect for the handyman or do-it-yourselfer who doesn’t require oodles of power and who isn’t planning on doing tons of demo work. Keep it lubricated for best performance – especially where the blade change action is concerned. Its very reasonable street price makes it one of the more handy “gotta-have-it” tools we recommend for anyone who plans on doing any type of projects around the home. It’s so inexpensive that it’s hard not to recommend it though contractors will want to look at some of the more feature-rich and robust models.